The 20-minute process to raise the 213-foot-tall (65-meter) Falcon 9 rocket at pad 39A was completed shortly after 5 p.m. EST (2200 GMT) Thursday, allowing SpaceX to complete final tests with a fully-assembled booster at the launch facility for the first time. 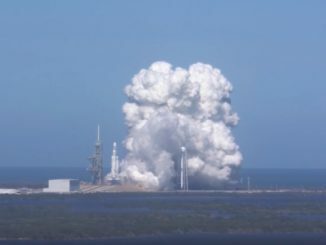 The Falcon 9 rocket previously stood on the launch pad Sunday for a hold-down engine firing, but the launcher was without its payload for that test. The rocket will be lowered again Friday to pack “late load” cargo inside the Dragon supply ship, including mice to be examined for signs muscle and tissue loss in microgravity. The rocket will go vertical again some time Friday evening ahead of Saturday’s final countdown.